My account gained 0.5% this week, while SPY fell 4.6%. I’m just 0.5% away from beating SPY for year-to-date! News: It looks like the “two-week rally” has been cancelled. The news out of Europe is very bad. Europeans liked the recent France+Germany conference on the national debts about as little as they liked the Republicans+Democrats on the US deficit. DRETF: Dividend arrived on Tuesday. The next dividend will become payable on Friday AU26 or so, but the stock is not doing well so I don’t think I’ll buy it back yet. FRED: Friday’s sale of the shares settled on Wednesday. There doesn’t seem to be any point in showing daily values for the already-sold puts. RWM: Doing great! Increased my holdings on Friday to prepare for a possible crash next Monday; now it’s 26% of the account. Although the puts were sold some time ago, their daily values continue to fluctuate because they are addends to the daily percentage gain for the shares. Math is hard! IAU: Doing great! Gold is confounding the pundits by continuing to climb. Increased my holdings on Friday; now it’s 19% of the account. The new shares have a 5% trailing stop (which is higher than the put strike price for the old shares) because gold almost never drops 5% from its peaks unless it’s going into a major correction. The price of the puts seems ridiculously low; perhaps this is a side-effect of Options Expiration week? RPRX: Continuing to do badly. As with gold, the put-price seems ridiculous. Hopefully it will pick up next week after Options Expiration week ends. The max-loss value is less negative this week because I’m still trying to get the math right; the actual max-loss value (whatever it is) hasn’t changed. FXF: ½ sold Wednesday settled on Monday; ½ sold Thursday settled on Tuesday. Looks like the bull run is over for now. SCHA: This week I decided to record each purchase of SCHA separately, since they have different max-loss values. But in the end it didn’t matter because my “emergency stop — sell all SCHA!” order triggered at Thursday’s open. Overall, the picture we see is similar to two weeks ago: unexpectedly low prices on Wednesday, mini-crash on Thursday, rout on Friday, leading to a crash(?) on Monday. I am so ready! SCHA#0: Leftover shares from last week. Settled on Wednesday. SCHA#1: 1% trailing stop. Sold at gap-down on Tuesday, but still eked out a profit! Settled on Friday. SCHA#3: Fixed-price stop at the ”emergency sell-all” level. SCHA#4: 3% trailing stop from a lower starting price. SCHA#5: 1% trailing stop, bought at 3:59PM in case the market gapped up on Friday—but it gapped down instead. 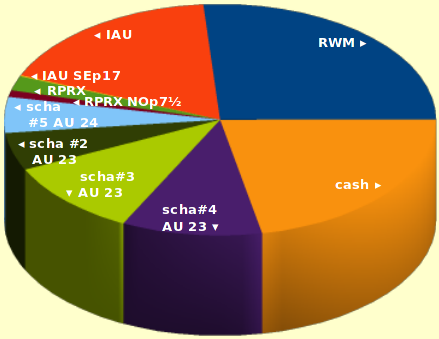 On the pie chart, the yellow strip for the IAU puts is nearly invisible. It is much smaller than it should be because the last-sale price was too low. Also, the brown strip for the RPRX puts is way too small. I am not sure what this is trying to tell me. Are RPRX speculators panicing and selling their puts for waaay below intrinsic value? Is RPRX about to go out of business and I should exercise the options while I still can? Hopefully things will clear up next week. If there is a crash on Monday, I plan to spend all available cash buying SCHA near the close, to prevent lossage from a rebound on Tuesday. But I won’t have enough settled cash to completely neutralize RWM until Tuesday when most of the already-sold SCHA shares settle.